When Clare, our Travel & Nature writer asked me – the Food & Drink guy – to write about Magellanic Penguins in Patagonia, I jumped at the chance. Penguin steaks are utterly delicious! I had come to Patagonia with two objectives in mind: 1. Get to the end of the world. 2. See penguins. The first objective royally met, we found ourselves in nearby Punta Arenas – a windswept former penitentiary and modern-day magnet for the tourism and oil industries – on the hunt for the latter. We had read that we could visit the Pinguinera at the Seno Otway colony a short drive along the coast, but were advised by locals that sightings were unreliable. So we opted to take a more expensive but worthwhile trip to Isla Magdalena, to encounter its thriving Magellanic penguin colonies. The added bonus was that we needed to take the Melinka ferry to the island. We love ferries. The first thing you notice when you get to the desolate island is how small it is. We were told we could only stay on it for 60 minutes, and that we would have to peg it if we wanted to walk there and back to the lighthouse on the far side within the hour. The lighthouse was clearly visible from the tiny harbour; at a brisk stroll we could find ourselves there in a quarter of an hour. The second thing is the sheer abundance of penguins (and their friendly neighbours, seagulls). This was, as a friend back home had suggested, penguin heaven. They were practically escorting us off the boat. The third thing was the appalling smell of gone off fish that hit our olfactory senses as soon as we landed. The place hummed. The fourth thing was the noise: we’ll get to that shortly. We embarked and stood gawping in amazement at the other-wordly sight before us. The Magellanic Penguin (Spheniscus magellanicus) is native to South America, particularly Chile, Argentina and the Falkland islands, although they are in no way Antarctic birds. In fact they have been seen as far away as Brazil and El Salvador, making them something of a sun-worshipping breed. About 20,000 of the colony have already made plans to attend the Carnival in Rio next month. They are named of course after Portuguese explorer Ferdinand Magellan, who sighted them in 1520. Right, wanna see some penguins? Of course you do. The Magellanic penguin is medium sized, and can grow up to 76cm in height. Its flippers propel the bird through the water as if in flight, whilst it hunts its prey. They eat mainly fish (obviously), including squid and cuttlefish, although some are quite partial to the odd plate of lomo a lo pobre. Like its close relatives the Humbolt, Galapagos and African, Magellanic penguins have white and brown-black markings, with a distinctive black bands between their head and the top of their white chest. 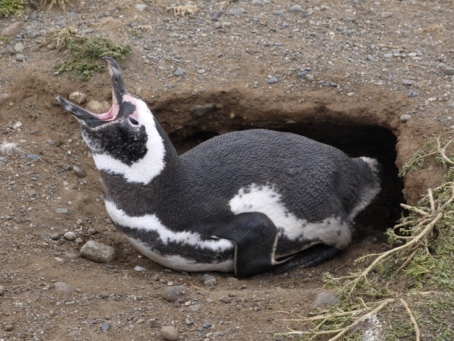 When they are ready to breed, they head to islands like Isla Magdalena and their biggest colony in Punto Tombo, Argentina, and start honking, very, very loudly. The male tips his head right back and goes for it, emitting a big, raucous ratcheting that culminates in a fantastic siren sound. That explains the ungodly noise on the island. This charming trait apparently attracts the female, who he then smacks around with his flippers. I have seen the same sort of behaviour in Cardiff on a Saturday night. Once they have mated, the penguins stay coupled for life, the female recognising her partner’s distinctive honk. Ahh. Two eggs are usually laid in quite deep burrows, which pock-marked the island like rabbit warrens. Both parents incubate the eggs for about 40 days, and care for the brood for a month once they’re born, providing board every three days: after that they are pretty much on their own. There were 69,000 couples on this island alone, plus children. 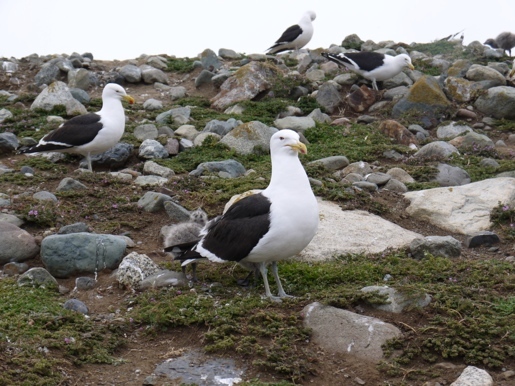 During the brooding period one parent always stand proudly on sentry duty next to their ungainly off-spring, who are covered in a grey coat of fluff that protects them until they are fully grown. Despite the staggering numbers we had the privilege of seeing in our allotted hour, the Magellanic penguin has actually been listed as ‘near threatened’ since 2010, due to a combination of climate change, offshore oil extraction and increased fishing of its prey. Lack of food for their young has forced the parents to swim further from shore than ever, occasionally getting lost in the process. Double ahh. Before we knew it, our guide was shouting warning sounds to rival her subject matter: our 60 minutes were up and we were ushered back to our waiting ferry, for the two hour journey back to the mainland. Against all her professional advice I tried to encourage Dave to jump into my capacious double-lined hiking jacket, as I felt sure that it would provide a warm and cozy ride back to our hostel in Punta Arenas, where, taking inspiration from Andrey Kurkov’s Death and the Penguin, I intended to keep him entertained with fun balancing games in a bath full of ice. Dave, however, wasn’t having any of it and despite my best efforts, waddled off to honk at a nearby honey. We took the hint and headed back to the boat to warm up with a hot chocolate. I was feeling bereft by the loss of my new fine-flippered pal, but Clare reminded me that we were likely to see some Humbolts later on in our trip – and besides, the price of fresh fish in Patagonia plus the unavoidable fact that Dave would probably have been a bit of a smelly travelling companion, meant we were better off without him. This might be my favorite post to date! The sentry penguin photo is too adorable for words. Glad you got to tick “end of world penguins” off your bucket list. Cheers 🙂 Yup, the baby penguins were darn cute. I couldn’t believe that however far they swim, they always come back to this same island to mate. Very entertaining and great photos. Unfortunately I don’t think my lad will be very engaged. Don’t really know where I went wrong though he does know his football. Did you know I once swam with dolphins?